In the 2018 Worldwide Broadband Speed League the UK has slipped from 31st (2017) to 35th place. 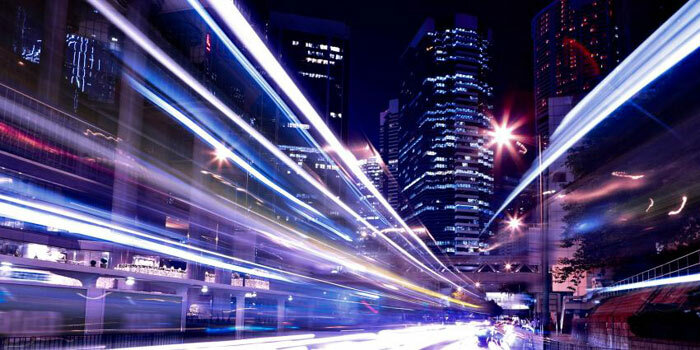 Cable.co.uk emailed HEXUS with its latest survey findings which are derived from over 163 million broadband speed tests worldwide. As well as the headlining slippage in the UK's world ranking, it was revealed that the UK's average internet connection speed is 18.57Mbps. For the latest speed results on an interactive map you can head on over to this page, or alternatively check through the rankings and speeds data in an excel spreadsheet hosted on Google Docs and which provides a more detailed year by year comparison. The UK is ahead of 165 other countries globally. While the UK slips in its ranking, at least the average speed has risen, from 16.51Mbps in the 12 months to 10 May 2017, to 18.57Mbps in the 12 months to 29 May 2018 (a 12.5 per cent speed increase). Globally, average broadband speeds have risen from 7.40Mbps to 9.10Mbps during the same period - a year-on-year increase of 23 per cent. Dan Howdle, consumer telecoms analyst at Cable.co.uk, said he expects that "despite plans to roll out FTTP to UK homes across the next decade or so, the UK is likely to fall further behind while we wait". Looking at the best and worst countries for broadband speeds, Singapore maintains its pole position with an average speed of 60.39Mbps. 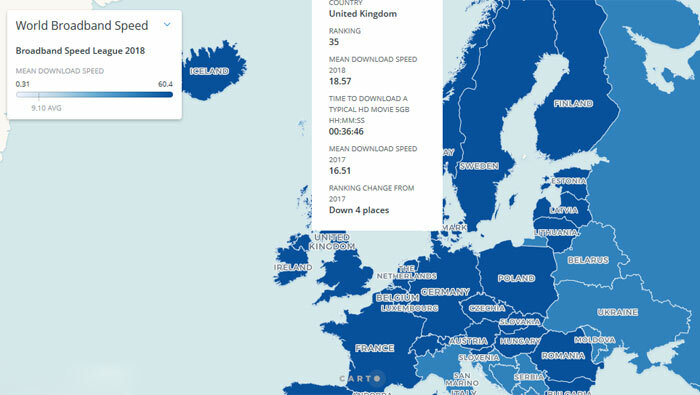 European countries make up the rest of the top 10; Sweden (46.00Mbps), Denmark, Norway, Romania, Belgium, Netherlands, Luxembourg, Hungary, and Jersey (29.92Mbps). At the other extreme, in position number 200, Yemen residents must have a hard time enjoying Netflix or YouTube, with an average 0.31Mbps connection. To put the numebrs in another perspective, Singapore residents could on average download a 5GB movie or file in 11 minutes and 34 seconds, while those in Yemen would need to wait over one and a half days on average. Overall, 136 countries failed to achieve average speeds above 10Mbps, a speed deemed by telecoms watchdog Ofcom to be the minimum required to cope with the needs of a typical family or small business. 35th!!!! how can we be so far behind Hngary!?? Blame BT for being so focused on shareholders and not providing the service they should have with infrastructure. Could be worse I suppose, we could be in America with little to no competition for who supplies broadband. Least Ofcom got something right. I think this is a good example of why “average” is always useless. Mean speeds don't matter, what matters is what the speed say the bottom 10% have. As someone who's get 78mbits in one place and 1gbit in another, I can tell you the difference it makes to me is practically zero. However, soon as I'm someplace below 4 mbits, it's almost pure hell. Well i lived in the UK as well as US and there isn't all that much competition in the UK either I have comcast in the US $60 175Mb actual speed for that price. I could go higher but not necessary. If you are lucky to live in google fiber city you can get 1Gb up and down or go with a basic package which is free. Yeah but in the UK, at least the regulators are (more) on our side than in the US where the regulators might aswell give up their positions and save the country some tax dollars.